The weather is as British as ever; so have some ice cream. Ah, British Summer. Rain, wind, stifling heat, mixed with the odd day of glorious sunshine. As my Father (who still professes to have just stepped off a plane despite having lived here for 50 years) succinctly puts it - Britain has four seasons; Winter, Winter, Winter and Winter. One thing's for sure; I wasn't risking a barbeque this weekend. Instead, it was Beef Wellington & bone marrow gravy for main, and these ice cream macaron for dessert. They are a combination of a cucumber & gin sorbet, soft Pimms and mint jellies, roasted strawberry ice cream and crunchy meringue pieces. Roasting the strawberries not only intensifies the flavour, it also reduces the liquid content so that the ice cream can still set but give off a good strawberry kick. There are quite a few processes, so I've tried to lay them out in an order that will allow some overlap during wait periods. 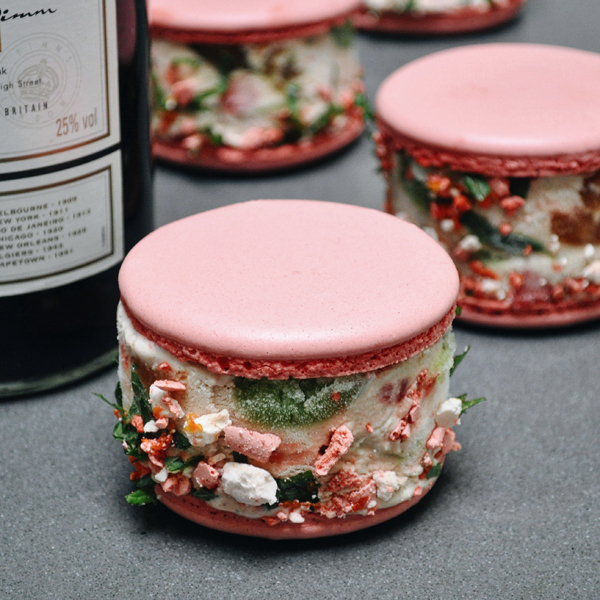 It's a lot of effort - but if you're into your ice cream macs, and rainy days, you'll love these. 2g Red powdered food colouring (Americolor) - optional; you can just leave them white! Turn your Ice Cream maker on to start chilling, and pre-heat your oven to 190 degrees C.
If you have a double oven, pre-heat the other one on to 140 degrees C.
Put the gelatine sheets into some cold water to soften. Weigh out your 200g of normal water into a heavy bottomed pot, pour in the sugar and liquid glucose. Bring this to the boil over a medium-high heat, and hold it there for 5 minutes. Take the pot off the heat, and let it cool to around 60 degrees C. Take the mint, finely chop, then add to the heated liquid. Don't be tempted to add the mint while it's too hot, or you'll end up with mint tea. Nobody wants that. While the liquid is still warm, squeeze off the excess water from the gelatine then add that to the pot and mix thoroughly. Finally, pour in the Pimms No. 1, the soda water and mix well. Take a tin - something like a square brownie tin - and line it with two sheets of cling film so it covers all sides. Pour in the liquid, then leave to set in the fridge for an hour or so. Put the hulled strawberries on a silicone mat. Twist over the black pepper, then pour on the balsamic vinegar and golden syrup. Put the mat into a tall-sided tray then put it in your oven, pre-heated to 190 degrees C, and roast for 40 minutes. Give them a turn at 20 minutes just to make sure all the sides are roasting evenly. When time's up, remove from the oven and let cool slightly - don't leave them for long or you might end up with a solid block. Put them in your food processor or blender, and whizz until you have a puree. Reserve 100g for the ice cream. This is the easy bit; place the chopped strawberries in a bowl, cover with sugar, pour in the Pimms and mix with a spoon to combine. Leave at room temperature for the rest of the time it takes you to complete the recipe. Split the two cucumbers down the middle, then use a teaspoon to scrape out the seeds from the middle. Roughly chop, leaving the skin on, and put into a food processor or blender. Weigh in the Icing Sugar, and finally squeeze the juice of two lemons into the food processor's bowl. Blend this for 10 minutes, to try and extract as much flavour as possible. When time's up, use a fine sieve and pour the puree through so that you're left with only the liquid. Mix in the gin. Pour the mix into the Ice Cream maker bowl, and churn until you have a sorbet. When it's ready, transfer to a disposable piping bag and reserve in the freezer. I'm going to be lazy here - please follow my instructions for making macaron shells here, here or here. Once you get to the piping stage, remember that these need to be bigger than your standard macaron shells. We want the end size to be around 8cm - so I'd say pipe to about 4cm and then tap to spread. Once the shells have baked, set aside to cool and turn the oven down from 140 degrees C to 110 degrees C.
Beat the egg whites in your stand mixer until soft peaks form - normally less than a minute on a Kitchen Aid up at full whack. Slowly shower in the caster sugar, then leave it running on high for about 10 minutes until you have stiff peaks. Turn the mixer down to low. If using, sprinkle in the powdered colouring, followed by the icing sugar. Give it a quick 30 seconds on high, then turn off and transfer to a piping bag. Take a baking tray, and place a silicone mat on top. Pipe any shapes you like - we're just going to crush them - but make sure they are reasonably small so we get a good amount of crunchy shell rather than sticky innards. Place in the pre-heated 110 degrees C oven, then cook for 60 minutes. When done, remove and allow to cool before crushing roughly. Place the 150g of milk in a heavy bottomed saucepan, add the caster sugar and vanilla powder. Measure out 500g of double cream (fridge-cold) into a bowl, and put a sieve on top. Place the egg yolks into another bowl and whisk for 30 seconds. Pour the 100g of puree into a second saucepan (so that it's warm too and doesn't split the mix). Gently heat both the milk and the puree. When the milk comes to the boil, temper the eggs by pouring a little over them while constantly whisking. Pour a little more, then whisk again. Repeat until all the milk has been combined with the egg yolks, then pour the lot back into the saucepan. Keep heating over a low heat, stiring with a wooden spoon. Eventually, it will slightly thicken - just so that when you run your finger down the spoon, it will leave a trace. When it reaches this point, turn off the heat and pour in the warmed puree. Stir again to combine, then pour through the sieve into the cold cream. Mix again, much more vigorously this time. When everything looks mixed nicely, pour directly into the pre-chilled ice cream maker and churn. There's no need for any of this "put the mix in the freezer for 24 hours before churning" nonsense; there never is. Sieve the liquid off the macerated strawberries - which is now a nice sugary Pimms flavour - and drop this into the ice cream bowl too. Finally, weigh out your final 35g of Pimms and pour it in. After 30 minutes to an hour, just before it completely churns, drop in the macerated strawberries, and about half of your crushed meringues. At this point remove your cucumber sorbet from the freezer to warm up a little. Now that your ice cream has churned, line a tin or try tray that's around an inch or so tall with cling film. Use a spatula to transfer the ice cream in. Next, pipe 3 even lines of cucumber sorbet into the ice cream so that they run the length of the tray. Take your set jellies out of the fridge and roughly chop about half. Press the pieces into the soft ice cream, around the cucumber. Cover with another layer of cling film, then put back in the freezer. Chop the mint into ribbons, and grate the oranges into a bowl. Crush up some of the meringues. Remove the tray of set ice cream from the freezer, and cut 8 circles out, trying to get a line of cucumber sorbet inside each one. Working quickly (it's a soft ice cream!) put a toothpick or fork in the top of each cut circle, then roll the edges in the mint-orange-meringue mix to coat. Place onto a macaron shell, then cover with a second shell. Place back in the freezer immediately and repeat with the remaining 7 ice creams. When you're ready to serve, remove from the fridge for 10 minutes then scoff. Perhaps with a glass of Pimms. Or even better, straight gin; you might need it after all that work.